Seattle City Light is performing emergency repair work beginning this weekend, Saturday, May 13 and Sunday, May 14 to maintain the electrical reliability in the Belltown area. Crews must repair underground electrical conduits that have shifted out of place near the intersection of Eighth Avenue and Virginia Street. The work is a necessary first step to ensure that no further shifting takes place and to prevent failure of underground electrical cables. West bound traffic on Virginia Street will be detoured. Traffic, parking, and pedestrian impacts will occur near the worksite to promote safety and accommodate equipment. Electrical crews will be working at night following the excavation work. That work involves crews working in the nearby vault, so it has a smaller impact. This work is scheduled to start on Saturday, May 13. Weekend work hours are from 8 a.m. to early evening, with possible night work. For additional information, customers can contact Brian Belger, Network Field Supervisor at (206) 730-0004 or brian.belger@seattle.gov. Starting in mid-January 2017, Seattle City Light will resume civil construction to install new vaults and conduit (duct bank) in the South Lake Union neighborhood. This project was previously on hold due to crew availability. The work will allow for increased electrical reliability in the surrounding area. Crews will be breaking street pavement on Harrison Street between Dexter Avenue North and 8th Avenue North to install the new electrical vault and conduit. During construction, Harrison Street will be closed to all westbound traffic from Dexter Avenue to 8th Avenue North, but open to all eastbound traffic. Crews will be breaking street pavement on Harrison Street and excavating across 8th Avenue North. One lane will remain open at all times. On Harrison Street, crews will work between 8th and 9th avenues north, Harrison Street will be closed down during work hours. Traffic will be detoured. At a later date, crews will work at 9th Avenue North and Harrison Street. Construction will resume with stage 1 in early to mid-January 2017 and last approximately four months. Work hours are scheduled from Monday to Friday, 9:00 a.m. to 3:00 p.m. and weekends from 9:00 a.m. to 6:00 p.m.
Customers can expect temporary parking and traffic restrictions. Traffic and pedestrian safety will be maintained by uniformed police officers. Noise is expected during daylight hours from jack hammering and heavy equipment. During construction, uniformed police officers will assist all drivers coming and going from garages located in the alleys. Trenches will be steel plated at night and traffic will reopen outside of working hours. Visit Seattle City Light’s construction website for the latest updates on this project: http://www.seattle.gov/light/atwork/release.asp?RN=357. This past December, Seattle City Light recently completed civil construction in parts of East John Street and Summit Avenue East, near Summit Slope Park. The project began in late September 2016 to increase the reliability of the electrical system in the Capitol Hill neighborhood. City Light recently completed civil construction near Summit Slope Park in mid-December 2016. Civil construction crews installed new conduit (duct bank) and an electrical vault on East John Street and Summit Avenue East. The electrical infrastructure installations will allow Seattle Parks and Recreation to proceed with their renovation project to enhance Summit Slope Park. Left: View of the construction work area on East John Street. Right: A vault shoring box is installed on East John Street. Sidewalks and planting strips that were impacted by the construction project were temporarily restored. A Seattle Department of Transportation (SDOT) arborist was also at hand during construction to ensure the protection of trees that were impacted by the project. Seattle City Light appreciates the patience of its customers during the construction for this project. For more information about this project and others in your neighborhood, please visit the Seattle City Light At Work in Your Neighborhood website. Search for utility construction projects in your area by neighborhood, address and ZIP code. Seattle City Light crews recently completed civil construction work on a segment of Minor Avenue, located in the Capitol and First Hill neighborhoods. The infrastructure upgrades will allow for increased electrical reliability in the area. During construction, crews installed new conduit and an electrical vault underneath the sidewalk on Minor Avenue. Civil construction crews installed new conduit (also known as a duct bank) and an electrical vault at Minor Avenue between East Union Street and East Pike Street. Construction started in mid-June 2016 and was completed in late September 2016. Left: Typical view of the construction work area on Minor Avenue. Right: A view of the sidewalk after construction was completed in late September 2016. Sidewalks, driveways and planting strips that were impacted by the project were restored. A Seattle Department of Transportation (SDOT) arborist was also at hand during construction to ensure the protection of trees that were impacted by the project. At a later date, SDOT pavement crews will complete the final sidewalk restorations on Minor Avenue. Seattle City Light appreciates the patience of its customers during the construction for this project. For more information about this project and others in your neighborhood, please visit Seattle City Light’s construction website. Search for utility construction projects in your area by neighborhood, address and ZIP code. In early September 2016, Seattle City Light plans to install new conduit (duct bank) between the existing electrical vaults on 6th Avenue and Cherry Street. Crews plan to excavate on the west side of 6th Avenue into the south side of Cherry Street. The new duct bank will be installed and the street restored. This project will allow us to provide new electrical connections in the area. This work will be completed in four stages, beginning with Stage 1. Stage 1 (September to October): Civil work on the intersection of Columbia Street and 6th Avenue will occur only on weekends. One lane will remain open on Columbia Street during work hours. Street parking will be restricted on 6th Avenue between Marion Street and Columbia Street. Stage 2 (September to November): Traffic will be taken down to two lanes on 6th Avenue on weekdays and some weekends. Stage 3 & 4 (Late November to January): Crews will work on the intersection of 6th Avenue and Cherry Street, and continue into the south side of Cherry Street. During work hours, Cherry Street will be taken down to one lane. Parking will be restricted on both sides of Cherry. Daily work hours are from Mondays through Fridays, 9 a.m. to 3 p.m., with some weekend and night work. Customers should expect increased traffic during construction. Uniformed police officers will maintain traffic and pedestrian safety. Crews will be careful to maintain access to buildings and parking garages. For more information, please contact Kristy Tibbetts, Crew Coordinator at (206) 684-3043 or kristy.tibbetts@seattle.gov. Visit Seattle City Light’s construction website for the latest updates on this project: http://www.seattle.gov/light/atwork/release.asp?RN=358 . Starting in mid-June, Seattle City Light will begin another project in the Capitol Hill & First Hill neighborhoods to enhance electrical reliability. Crews will be installing new conduit and an electrical vault along a segment of Minor Avenue between Pike Street and Union Street. During construction, customers should expect traffic and parking impacts in the immediate area. Uniformed police officers will also be on site to maintain traffic and pedestrian safety. 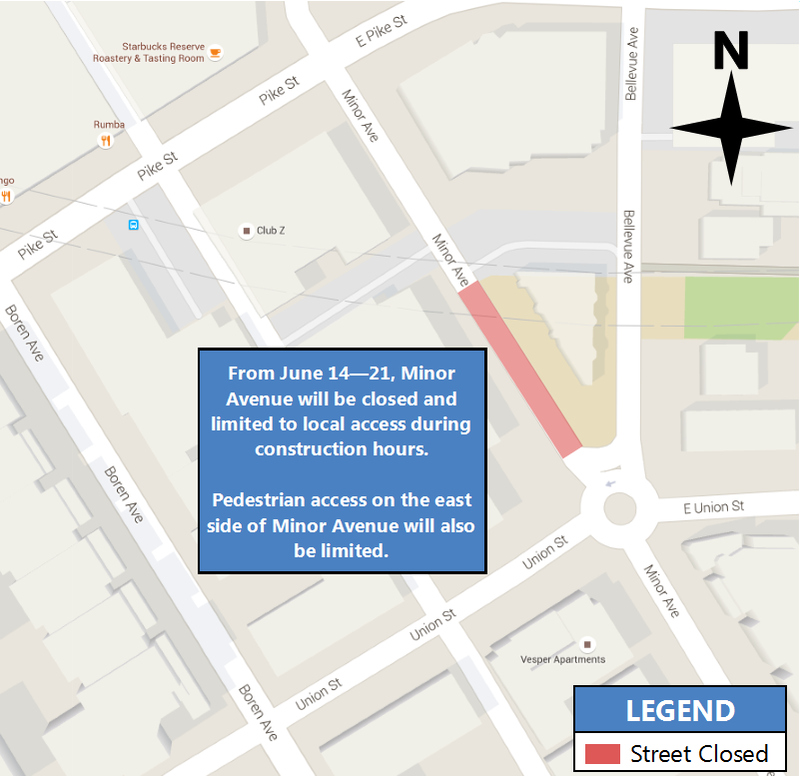 From Tuesday, June 14 to Tuesday, June 21, Minor Avenue will be limited to local access only as crews will begin excavating for the new electrical vault and build a shoring box. 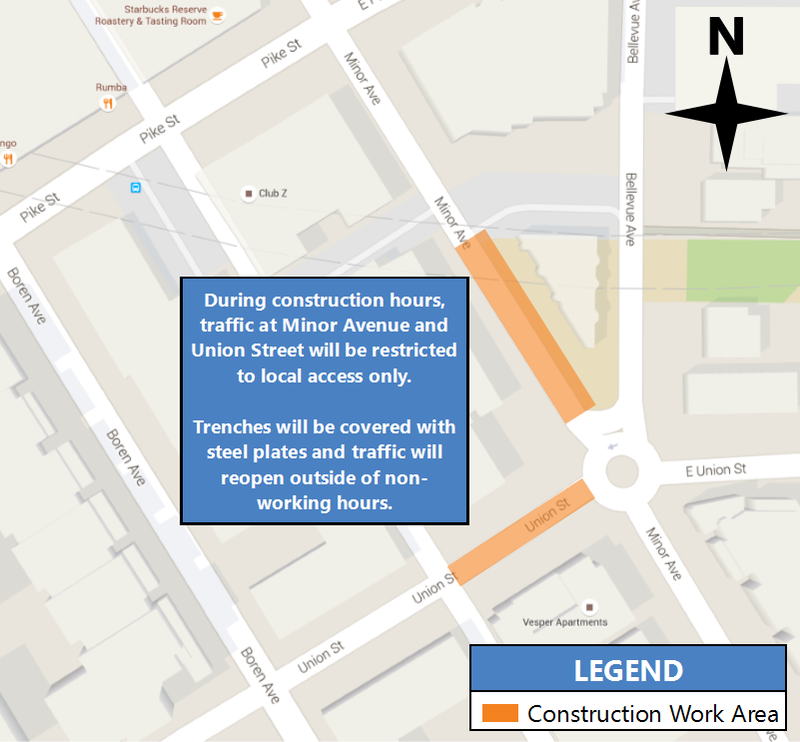 From Monday, June 20 to Tuesday, June 21, crews will assemble the shoring box for the electrical vault on Union Street. During this construction, Union Street and Minor Avenue will be closed. 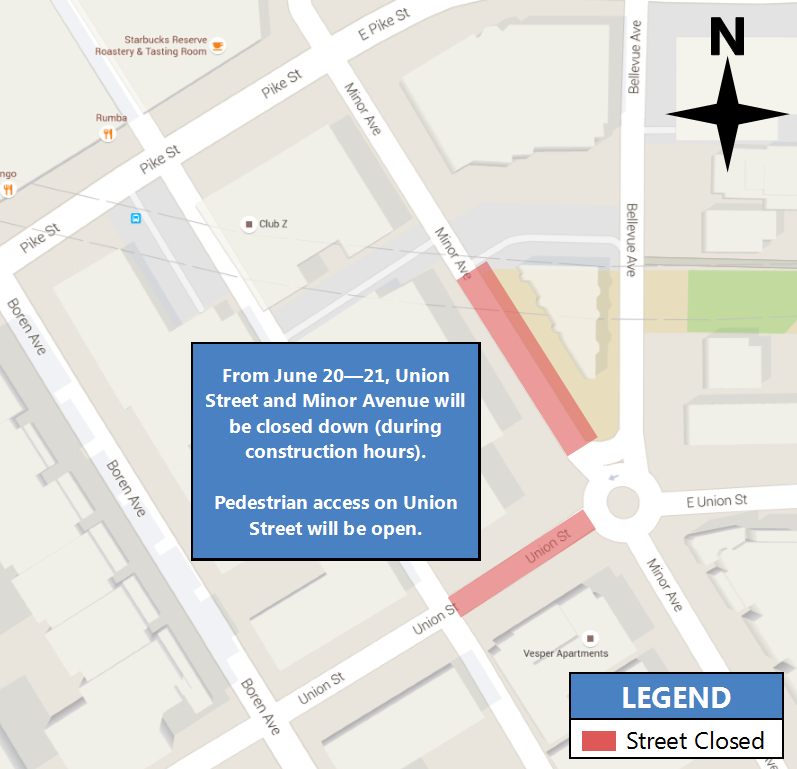 Pedestrian access on Union Street will be open. From late June to mid-August, trenching will occur along Minor Avenue. This is needed to install the new conduit. During this construction, Minor Avenue and Union Street will be limited to local access only. This project is expected to start on June 14 and extend for approximately eight weeks. Daily work hours are from Monday through Friday, 9:00 a.m. to 6:00 p.m., and Saturdays from 9:00 a.m. to 5:00 p.m.
For more information, please contact John Harvey, Electrical Service Representative at (206) 386-4275 or john.harvey@seattle.gov. This information is also available on City Light’s construction website: http://www.seattle.gov/light/atwork/release.asp?RN=362. Starting in early March, Seattle City Light will begin another project in the South Lake Union neighborhood. Crews will be excavating for new electrical vaults and conduit along a segment of Harrison Street. The project will enhance the electrical reliability for affected customers in the area. This work will be done in four stages, starting with Stage 1. Crews will be breaking street pavement on Harrison Street between Dexter Avenue North and 8th Avenue North to install the new electrical vault and conduit. During this work, Harrison Street will be closed. Stage 1 of this project is expected to start during the week of March 7th and extend for approximately two months. Work hours are scheduled from Monday to Friday, 9:00 a.m. to 3:00 p.m. and weekends from 9:00 a.m. to 5:00 p.m.
During construction, customers should expect some traffic and parking impacts in the immediate area. Flaggers will also be on site to redirect traffic and pedestrian access. Customers can contact Kristy Tibbetts, Crew Coordinator at (206) 684-3043 or kristy.tibbetts@seattle.gov. This Monday, Feb. 25, crews will begin installing a new duct bank, or conduit, across 5th Avenue S at S Washington Street in order to connect existing underground power lines and increase service reliability. Crews plan to excavate across 5th Avenue at the north side of the intersection with S Washington Street. This project will not involve any scheduled power outages. Location of construction work on 5th Avenue South and South Washington Street. Daily work hours are 9 a.m. to 3:30 p.m., Monday through Friday, with some possible weekend work. The project is projected to last for four to five weeks. At a later date, crews will install new cable over several days after civil construction is completed. For more information about this project, please contact John Harvey, Electrical Service Representative. Starting Wednesday, September 12, Seattle City Light will begin installation of two new conduits, or duct banks, in the downtown Seattle area across Columbia Street at 4th and 5th Avenues. The project is part of City Light’s ongoing work to upgrade the city’s electrical system to maintain and increase service reliability. Construction and installation will start with the duct bank closest to 4th Avenue on September 12 and then move onto the one at 5th Avenue once the first one is completed. Each duct bank will take approximately two weeks from start to finish. Crew will be working Monday through Friday, 9 a.m. to 3:30 p.m. with some weekend work possible. There are no scheduled power outages associated with the project, and two travel lanes will be open through the work zone on Columbia Street. Traffic exiting from the freeway and turning down Columbia may experience some delays. Signs will be in place at the exit from I-5 onto 6th Avenue, and on 6th Avenue between Marion and Columbia to direct drivers. Uniformed police officers will help with parking access beneath all parking garages and the parking lot at the Rainier Club. Some on-street parking will be lost on both sides of Columbia. “No Parking” signs will affect each block separately, starting first with the block between 4th and 5th and then the block between 5th and 6th. City Light’s own headquarters in the Seattle Municipal Tower fall within the work zone, along with the Bank of America Tower and Columbia Center Tower. Once the civil construction is finished and at a later date, crews will install new cable over several days. This work is much less intrusive, involving up to two trucks and lineworkers pulling cable into place and working inside the underground vaults. The trucks will take up some parking space and the work will impact traffic flow, but will not require extensive lane closures.